Art can seem intimidating if you haven’t been exposed to it in a way you can relate to. You find paintings and works you like and some you don’t; while other stuff just makes you scratch your head as you try to figure out what it’s supposed to be. Believe me, for all my time around artworks, I know how it is look at something you don’t understand and feel stupid as a result. I’m that way with music. I don’t know a thing about reading sheet music or music theory or any of the terminology, I just know what moves my soul when I hear it. I’ve spent thirty years noodling around the art world, learning the language of art as best as I could. And yes, every discipline of the arts has its own vocabulary, just like our craft does. To an outsider who doesn’t understand the words and their meaning, it’s hard to see how the concepts are relevant to your situation. This is the hurdle I face when I try to share concepts from the arts and show their relevance to modeling. I see this craft through an aesthetic lens rather than a technical one. With the I&W I’m attempting, in my own way, to express something about trains and a sense of place that goes deeper than surface appearances. This is why I dwell so much on the question of why and speak in terms of expression rather than technique. There’s a great thought from David duChemin’s photography book: The Visual Toolbox, that says, every technical decision has an aesthetic impact. The author is saying that every choice of shutter speed and aperture setting, where you stand and all the other decisions you make before pressing the shutter button, impacts the quality of the photo. The same premise applies to our modeling and layout design choices. That No. 4 turnout may let you squeeze in another siding but that decision comes with a cost to the visual and operational realism of the scene. When I speak of capturing the essence of a scene, I wonder to myself, for example, what is it about Richmond that makes it Richmond? Beyond the specifics of location and geography, what is the atmosphere, the feel, the essence of this spot that makes it like no other on earth? These questions can’t be answered by conventional thinking or rules, you have to go deeper. This is why I prefer the word principles in these discussions. The concepts behind rules and standards are both too rigid for such work in my view. One purpose behind establishing a rule is to reduce complexity and uncertainty down to a simple solution (when faced with that, do this), which of course, is why many people prefer rules. They take the guess work out of things. Thinking in terms of principles or qualities, allows for flexibility in their application to the specific. For example, when we picture an urban setting like LaSalle Street Station in Chicago, the quality of density comes in play. Trains, buildings, streets, cars and people are packed in tight. Things feel congested, cramped and closed in. How do you make a rule to ensure you have density? Well you could come up with a formula to calculate the number of buildings needed per square foot of layout space but, would such a formulaic process capture the essence of LaSalle Street? It would not. In this case, the intent of such a rule is too narrow for what we’re asking of it. The thing to study is how has the available space been utilized in this situation? In lieu of spreading out horizontally, how have vertical layers of activity (streets or buildings extending over or under the tracks) been handled? Are there spaces between buildings or has common wall construction been used? And so it goes. We have to let go of the idea that the essence of a place can be discovered via linear, rule based thinking and, herein lies the heart of the problem: the hobby doesn’t have an aesthetic language that equips people for this task. We have all manner of technical terms (and yes, rules) to guide track planning, operations and the like but to go beyond the technical, we have to think differently and look to other disciplines for the vocabulary we need. The path we want is found in understanding the quality or characteristic of an object or place and the words we use to describe them. One has to study the pieces and the whole along with the relationship between them. A particular landscape may have dozens of qualities but I’ll only touch on a couple for now, since this post is already long. I’ve spoken of this before but it bears repeating. When looking at a scene, notice how profuse the vegetation can be. Grasses, taller weeds, woody shrubs and trees may all be in abundance. Yet modelers are often stingy, especially if using commercial products. I get it. Such products aren’t cheap and simply putting a weed here and another over there stretches the hobby budget a little farther. And of course we’re told over and over, that anything that comes between us and the trains is asking for trouble. A mass of plants is needed to replicate nature. This is just a beginning. Wild grasses also cover a lot of ground. When I think of mass, I picture large clusters of the same plant covering an area. In the first photo above, I used at least three packages of these dead leaved branches from JTT to cover this embankment. That’s nearly two hundred pieces just in this small area (I placed two and sometimes three pieces in each hole for more fullness). Yes, it was expensive but worth every penny, because the context this landscape provides is as important to the story I’m telling as the trains are. 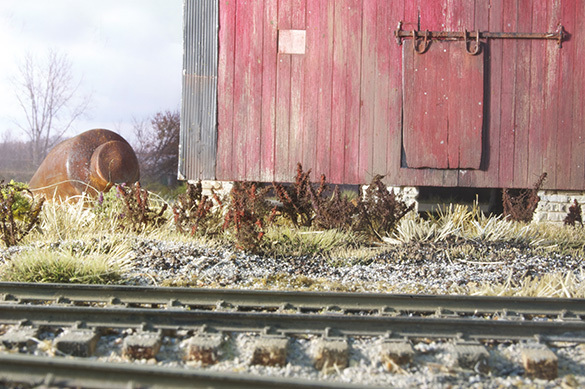 Another freight car would add nothing to the layout. From the finest moss to the tallest trees, vegetation forms distinct layers throughout the landscape. I’ve employed this principle with my scenery by creating four distinct layers of plants ranging from the short sisal grass to taller weeds, then woody shrubs made from thicker sisal rope and finally the trees. Combined, these elements provide a quality and character to my landscape that ground foam never will. 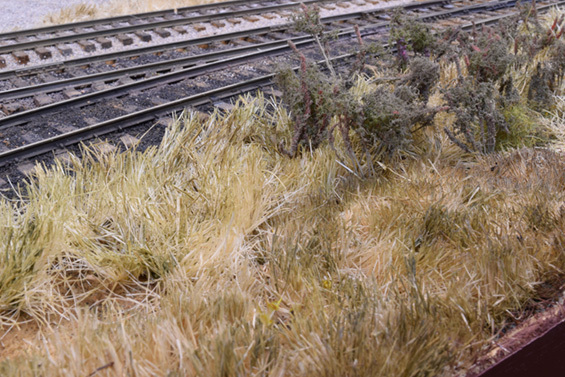 Paying close attention to such layers brings the landscape into closer scale with the trains. In quarter-inch scale this relationship is critical to realism, otherwise, the trains tend to dominate because everything else is undersized and flat. The texture and verticality we expect to see is absent. There are many other qualities and principles such as depth, texture, proximity, rhythm, height and scale. How color and light affect our perception of the landscape is worthy of its own book. (One I’m not qualified to write.) There are ways to increase the sense of space in a modeled scene without adding more square footage. In sum, there’s another world to explore beyond the technical limitations we’ve imposed on this craft and I’m happy to share what I’m discovering. I understand how strange and esoteric these concepts can seem, yet they’re not beyond anyone’s grasp with a bit of persistent study. And that is the key to anything in this craft. Read that opening sentence in the second paragraph again. I spent thirty years studying art and I still consider myself a rank novice. Such knowledge doesn’t come overnight but it will come in time. If you have specific questions or something is unclear, or you have topics you want to cover, just say so in the comments. Your recent posts on landscape and the power of place resonate with me, because I’m trying to come to terms with similar questions myself. Art is often explained in terms of the principles you list, such as mass, rhythm, texture, scale, layering. But I have trawled through books on aesthetic theory looking for advice on how to apply these principles to create a work and have not found anything convincing. Instead, such principles seem to be used to describe a completed work. Then I discovered the writings of architect Christopher Alexander, who talks exactly about how to create satisfying and pleasing objects: paintings, buildings or model railways. Surprisingly, he says that we should not apply principles to design or plan something before it is made, because there are so many decisions to make that we are certain to make some wrong decisions along the way and the result will be a mess. He cites most modern buildings as examples of this, because most town planning rules require all design to be finished before construction starts. – Step 1: Plan, then make the first thing, to the best of your ability. – Step 2: Plan, then make the next thing, to the best of your ability. – Repeat until the job is done. If/when you realise you made a mistake at one of the earlier steps, undo and throw away all the steps back to that step, then try again. – How do you know the right order to do things? You have to guess. Generally it’s from biggest to smallest things. – How do you plan a step? You take what you have made so far and make a full-size mockup of what you are going to do for the next step. Adjust the mockup until it looks right. The process is difficult but I have found it works. The result is usually something unexpected and delightful. I have used this to make two tiny model railways and they turned out well. I’m eager to try it for something larger. Christopher Alexander is not well represented on the internet. He has written books: ‘A pattern language’ our’The timeless way of building’ are probably the best introduction. Is part of our challenge the multidimensional aspect of our work? I feel like when I read a typical introduction to a model railway the builder describes it so many tangible terms: “I’m building a model of Hazelbrook, PEI as it was in November 1974” as if shrouding the work in fact-based definitions better connects the creator, the audience, and the work into a common vision where perhaps we need to shift that toward thoughts of what we think it would feel like to be there and on that day? Maybe it’s more along the lines of “I’m trying to create something that communicates how I feel when I think of…”? Is it important that when I look at it I see, in my work, something that takes me to that place? How important is it that when someone else looks at it they go there too? Maybe we’re at a point where we’d be better off not trying to recreate something exactly as it was but more along the lines of how we remember or reacted to it? If it wasn’t something we could have experienced firsthand, than create enough to provide agency to a memory someone shared with us that we connected with? There are some really great points in here. Thanks for sharing this. It reminds me of the old design-edit-design-edit… paradigm. I really enjoy preliminary design work but find it so easy to bogged down in the need to work out every detail before beginning. Worse, sometimes I launch into the design and find I forget where the good ended and the bad began so figuring out where to cut back to can be hard. These are lessons we could all benefit from and could use more exposure to. 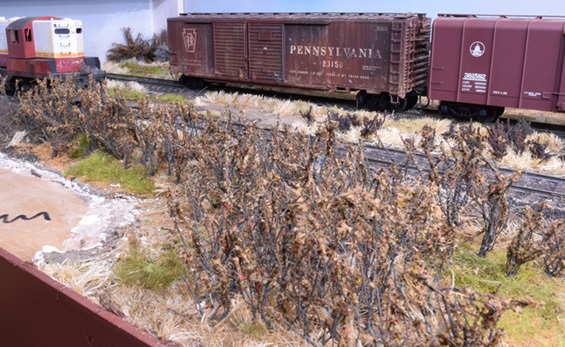 Maybe this is where such model railroading legends like the Allegheny Midland or the Cat Mountain and Santa Fe are so successful? Though entirely fictional they reflect their creator’s intimate understanding of their muse and allowed that alone to guide design decisions affecting form. We connect with the work because we’re sharing in those same queues. These are wonderful thoughts guys. Thank you both for adding to the discussion. Peter, I’m familiar with Alexander’s work and writings. I discovered A Pattern Language many years ago and found it very helpful in understanding the quality of a building and the sequence of the experiences involved in being in it. I’m less familiar with his other work though. Oh, I do request that people sign their posts as a courtesy to all. Chris, you’ve taken to conversation to a more interesting place as always. The thing to bear in mind with posts like this is the tendency to fixate on the details of the process rather than the results. I’m less concerned with a specific methodology of how to arrive at an outcome because people are so different in their approach. We each must discover what works for us. It’s my hope that the real value on offer here is in being exposed to a different way of thinking about what we’re doing. Demystifying the language of the arts and relating it to modeling brings new light to familiar subjects in my view. Process is certainly important but these posts are about a different way of seeing the work. How important is it for others to see as I see? It’s impossible for another to truly see what I see or to feel what I feel. We each bring our own experiences and bias to any work, whether it’s hanging in a gallery or resides in our basements. As such we tend to impose our own meaning on it regardless of the creator’s intent for the work. Sometimes a purely abstract piece is nothing more than an expression of form or motion or color rather than an interpretation of a literal object. If we’re confused by such expression, it’s because we are trying to impose our own meaning on the work in a way the artist never intended. It’s an excellent point though to suggest that a model can reflect our feeling of the time we were present with the prototype. I would suggest that is why 99% of the people in this craft say they are trying to recreate a memory of their past. This truly is a multi-disciplined craft. One that allows for as much sophistication and depth as a person is willing to bring to the work. Sadly, it is seldom presented in that way. This is a helpful approach. The decision over whether to add another spur or not can be made at a later date, when the rest of the surrounding layout can inform the decision. The cost of waiting is minimal. With regard to building design (and model railroad design by extension), I’d be interested to know how Mr. Alexander suggests controlling budget and schedule in the design? This may not be a big deal in the hobby as we’re dealing with discretionary funds anyway, but I understand why municipalities want to know what they’re getting (the design) before the money is spent (construction begins). Thank you again for putting your thoughts to this. In your first photo, you show a mass planting with several inches of landscape between the benchwork edge and the track. If you were to move the benchwork into the scene about half that distance (drawing the benchwork edge along the line formed by the bare patch in the middle-left of the photo), would the effect of mass have still been achieved? That is, is the effect more a matter of mass or density? Yes the effect of mass would have been stretched out horizontally with a narrower space. I think of mass in terms of the number of plants (or objects) and density in terms of the spacing between them. There are a high number of plants in the scene and they are closely spaced, giving both mass and density. If I had used the same number of them but left more room between individual plants the effect would be different and covered more surface area. I chose a closer spacing to create a more opaque view block.